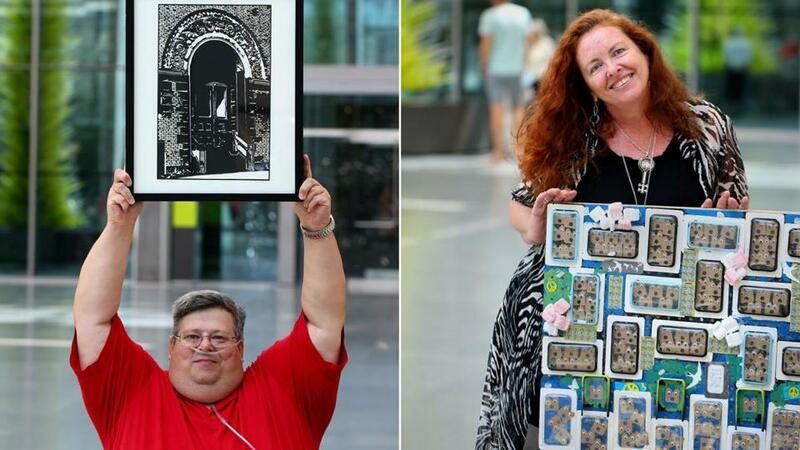 Artists Allen Chamberland (left) and Lori-Anne Fay (right). Among the Picassos, Homers, and Rembrandts on display at the Museum of Fine Arts, Memorial Day visitors will get a chance to see art borne of the struggles of homelessness and disability in Greater Boston. The artists are not household names, but all are exhibiting their works Monday in the Ruth and Carl J. Shapiro Family Courtyard as the museum opens its doors free of charge for the holiday. “I still can’t believe it,” Allen Chamberland, 50, said Saturday as he sat in the courtyard where his art is to be displayed alongside Dale Chihuly’s “Lime Green Icicle Tower” and Ai Weiwei’s “Forever,” a large sculptural work composed of bicycles. Chamberland said he never dreamed the images he creates using a paper-cutting technique would be exhibited at a world-renowned museum. Chamberland and artists Elizabeth Belstraz, Lori-Anne Fay, and Kitty Zen got the opportunity to present their works through a partnership between the MFA and ArtLifting, a Boston public benefit corporation that sells artwork by homeless and disabled people. Public benefit corporations are for-profit businesses that are legally bound to fulfill a social mission. ArtLifting does accept donations, but they are not tax deductible, said Liz Powers, who established the company with her brother, Spencer, in 2013. The four artists exhibiting at the MFA are among 80 represented by ArtLifting in 11 cities nationwide, Powers said. ArtLifting acts as a broker for artists, giving them 55 percent of the revenue from every sale, Powers said. One percent of sale revenues pays for supplies for art groups in shelters and disability centers, and 44 percent goes to ArtLifting’s operations, she said. The creations of the ArtLifting artists are nods to the “Megacities Asia” exhibition on display at the MFA, said Linda Apple, the museum’s director of volunteer and community engagement. Apple said as many as 8,000 people visit the MFA on Memorial Day. The artists will be at the museum and will discuss their work with patrons at 11 a.m., 2 p.m.,, and 3 p.m., she said. This is the second time ArtLifting artists have been featured at the museum. Last year, a group of women, including Fay and Zen, showed their work in a classroom on a Wednesday evening, when admission is free, Apple said. The courtyard, however, is a more high-profile exhibition space. The museum is also selling tote bags featuring the artists’ work in their gift shops for $35 each. Artists Elizabeth Belstraz (left) and Kitty Zen (right). Chamberland, who lives in the South End, is presenting two works, one depicting the back of Trinity Church and the other showing a doorway on Newbury Street. Both places, Chamberland said, are beautiful spots, where the homeless gather at night to sleep. Chamberland photographs his subjects first, mounts the high-contrast photographs on the back of silhouette paper, and then begins cutting with an X-Acto swivel knife. The exacting work takes hours, he said. One component of a recent commission he did for Harvard Business School required about 96 hours of cutting. But the results are getting Chamberland closer to making a living from his art. Chamberland, who uses a motorized wheelchair and oxygen, said he lives on just over $800 in monthly disability payments and suffers from Swyer-James syndrome, a chronic, progressive lung disease. Like Chamberland, Fay said she’s been living on monthly disability income for about six years and is about to lose her apartment in Roslindale. Fay, 57, said she has Fuchs endothelial dystrophy and underwent surgeries in recent years to replace her corneas. The genetic condition, which threatened to steal Fay’s vision, inspired her to become a photographer. Her piece for the MFA mixes photography, cellphone cases, cut-up credit cards, packing materials, and digital art in an examination of housing inequality. Belstraz said she plans to present a mixed-media bas relief painting about expansion in Boston. 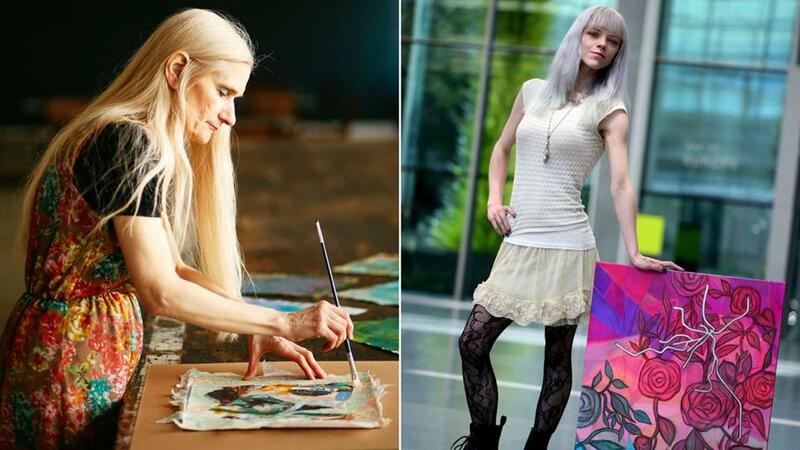 Belstraz, who said she was once homeless, now lives in Cambridge and is a graduate of the School of The Museum of Fine Arts. Zen, 25, created three paintings for the exhibition. She said she was introduced to ArtLifting about two years ago while she was staying at the Harvard Square Homeless Shelter in Cambridge. Tears rolled down Zen’s face as she reflected on exhibiting at the MFA last year.